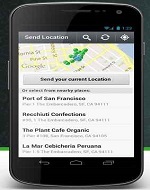 WhatsApp has a special feature by which user can send their current location. The location will be sending in the form of image of the map of your current location. This can be used when you are unsure about the location of your friend when you are out to meet them, but both should have the application and access to internet. Well this trick will help you to share your current location on WhatApp. Open WhatsApp and start a new conversation or open any existing chat. Tap the paper clip icon at the top-right > location (Google Maps icon) > tap send. Open the app. Open any conversation or start a new one. Tap the up arrow icon to the left of the form where you type whatsapp messages > Share Location > Send Your Location. Open WhatsApp on BlackBerry start a conversation or open any chat. Press the BlackBerry button > Send Location. Start WhatsApp and open or start a chat. Tap the paper clip icon > Location. Hope this may help you a lot. If you think this was helpful to you please do not hesitate to like or to write your comments and share this.